Currently hospitalized for multiple pelvic fractures and an injury to his lumbar vertebrae, Andy Lau (劉德華) will be bed-ridden for the next few weeks. For a safe and speedy recovery, Andy is forbidding hospital visits from even his close friends, so he can use the time wisely to rest. The 55-year-old actor did, however, allow Alan Tam (譚詠麟) for a short visit. Alan, who just completed his concert with The Wynners (溫拿) in Macau, returned to Hong Kong on Sunday morning and met up with Andy that afternoon for a brief business meeting. A workaholic, not even hospitalization is stopping Andy from work! Alan’s visit lasted 40 minutes. He stuck around briefly after his visit, to update the reporters on Andy’s current condition. The 66-year-old singer said he feels honored to be the first one to successfully visit Andy in his hospital room. On January 17, while filming a commercial in Thailand, Andy was thrown off his horse and was trampled on, fracturing his pelvis. He was flown back via air ambulance and was brought to the Hong Kong Sanatorium & Hospital on the early morning of January 19. Sources say Andy’s pelvic fracture was serious, and he had to take painkillers to ease the pain. It has been hard for him to sleep. Sources say it would take at least three months for Andy’s fracture to complete heal, and he would have to go through intense physical therapy. Andy’s wife, Carol Chu (朱麗倩), has been by his side to care for him. 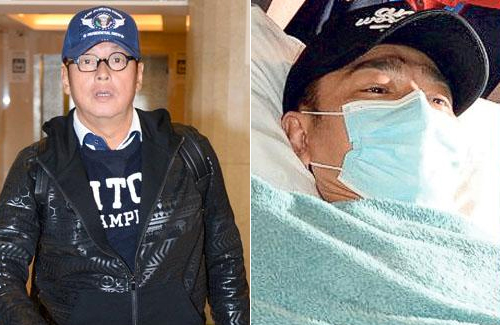 Though Andy has expressed his wish to go home for Chinese New Year, his doctors reportedly denied the request. Wishing Andy a speedy recovery!! Gosh it would be a shame if he isnt able to do any more action movies, if he has restricted movement. Pelvic fracture and injury to vertebrae is very serious! Imagine if he cant walk again! omg !! Too devasting to even think about that ! Hope he will make a full recovery. So scary on what happen. just glad he is OK even though he is hurt. Count his blessings- it could have been a lot more serious like Christopher Reeves. Speedy recovery! Scary! Andy should reduce his workload.